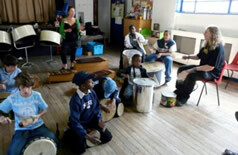 Camberwell Choir School (CCS) is a community project giving children and young people 0 to 18 access to high quality arts education at nominal cost. We meet on Saturdays during term time in St Giles Hall, Benhill Road. CCS is a registered charity (1002667) primarily funded by donations from individuals, though we also receive occasional grants from trusts and other funding bodies. 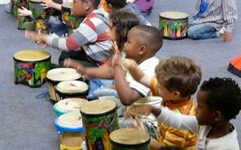 Our emphasis is on having fun while learning musical skills – singing and playing a wide range of instruments, listening and working together and developing confidence and self worth. 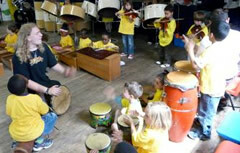 There is a great ‘family feeling’ to our sessions and we provide termly performance opportunities. To find out more about individual age groups click on the boxes below. We’re proud to have as our patron world-famous bass-baritone Sir Willard White who has supported us by singing for us to help with our fundraising, as well as visiting the project and meeting the children, to whom he is an inspiration.